Let’s get ready to…RUMBLE! Next Wednesday, June 8, the monthly free music showcase rolls into town featuring a trifecta of Cali-based indie artists including Sacramento’s Sister Crayon, San Fran’s Excuses for Skipping and LA’s White Arrows. Our very own DJ Bagel Ted will be spinning tunes as usual. And true to form, the event is free. But to get your free pass, you must RSVP at Eventbrite here. Otherwise, it’s $5 at the door. See you there! 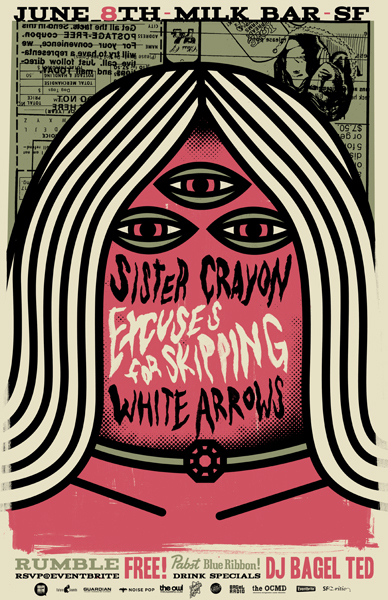 This entry was posted in Shows and tagged excuses for skipping, sister crayon, the rumble san francisco, white arrows. Bookmark the permalink.